Just clicking on a link to a website can get your computer/ device infected with malware. The link could open a malicious website loaded with malware that gets loaded on to your system. You must have experienced websites that just don’t seem to close when you try to. And websites spewing advertisements that display vulgar or inappropriate content. Visiting some websites will scare you that your computer is infected with malware. If you intended to visit an e-commerce website or a banking website you must ascertain that the website is completely safe before sharing any credentials (log in ids, passwords, and credit card numbers). You must perform a website security check. Cyber criminals are clever and are constantly upping their ante with more sophisticated ways to infect websites and develop malware-loaded websites. Your browser could be considered as a sturdy defence, and hence always keep it updated. It can be considered as the first line of defence when you do not have an anti spam gateway or any other protection for your mail server. Use a browser such as Google Chrome or Mozilla Firefox that constantly update their browser for better security. Further, they take proactive measures to warn users of malicious websites, and block malicious/ suspicious websites, and block websites that do not have valid SSL certificates. Browsers are free – so use reputable browsers. Further, browsers contain built-in security tools that can be activated by the user. These tools allow users to perform numerous settings such as disabling Flash content, block popups, control webpage access to camera and microphone. Do not open links directly from emails, social media messages or text messages. Do not click on the links. And avoid clicking on shortened URLs. If in case you must open them, then first verify their expansion using shortened URL verifying tools. Next, you must mouse-over the URLs which will display the true and complete URL. There are methods to truncate and display URLs which can fool users into clicking on the link. These links display the address of banks and financial institutions. And if you are not wary you will be redirected to a spoofed website. SSL certificates serve to provide a secure connection between the website and the user, and as well as to prove the authenticity of the webpage/website. This is an important verification method and browsers display the site information (secure or otherwise) in the address bar. The name of the organization is displayed in green color along with a lock symbol that denotes security. Each browser has a different way of displaying security, and it is important to keep your browsers updated for the latest data on the SSL certificates. When you have to visit a website and you are suspicious about it, then you can perform a website security check to check the website for malware. 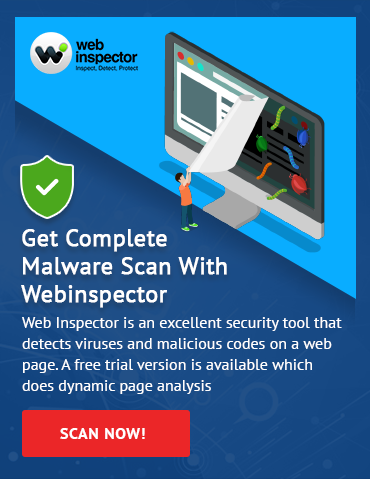 Popular tools are Comodo Web Inspector which comes equipped with Free Website Malware Scanner, and Google’s Safe Browsing tool. These tools display warnings to users when they try to download dangerous files or navigate to dangerous sites. For website administrators, it would be a prudent proactive measure to regularly perform website security checks to ensure that their websites remain safe and uninfected. And for users, these two tools are easy ways to check if a website is safe.